Oh, yeah, you're probably wondering about the picture. I sprained my ankle last week. 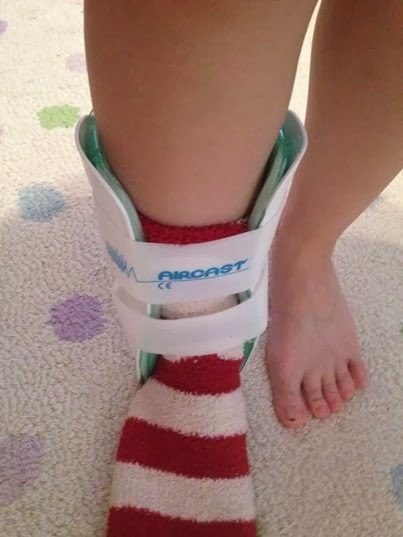 It rolled, which it does pretty often, and then I had to wear snowboots to get around and I worked with this ankle for two days (and I work retail, so I'm on my feet from anywhere from 4 to 9 hours when I work) before realizing that this was not like those other times when the ankle rolled. It did not go back to what passes as normal after two or three days. So, as I posted last week or so, I finished the NaNo 2013 project. If you care to read it, here's a link to its home on GoogleDocs. Fair warning: it was uploaded so it might not save your place as you're reading. Also, the story has links within the text because I basically spent November watching far too many Broadway show vlogs on YouTube as "research." 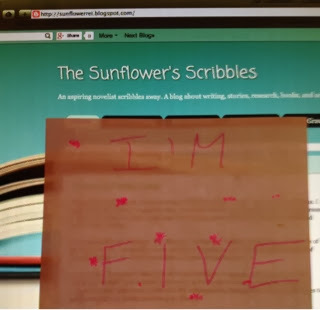 Today is this blog's fifth birthday. Hard to believe. It's in kindergarten now. I try to mark every blog birthday a little differently. It's another year that I've kept writing. This blog wasn't opened to the public until more than a year after I started it. In fact, it may have been two years after I started it. I finished the outline for my fourth draft. It is 66 pages long. Right now, I'm on a "I finished it" high, so I'm not being very objective, BUT I think it's a definite improvement over my third draft. There's a plot. There's a climax. There's an end. Now I guess I have to write the damn thing. Actually, I don't think the writing will take too long, if only because it's a fourth draft. It's more a matter of a LOT of fine-tuning and tweaking and rewriting. And a lot of deletions of pointless but cute scenes. And a cut POV. And several cut or pared-down characters. Also, I finished my NaNo '13 project. As in, the thing I swore I was going to leave hanging now has a decent ending. The characters cornered me in my sleep a couple of days ago and gave me the puppy face (Colin) and stink eye (Emma) until I gave them a couple of closure-ish scenes. So now they're done. First of all, to call only the second semester of Fiction workshop class "Advanced" is hilarious. I took Advanced Fiction, a workshop class, the second semester of my freshmen year at Emerson College and unlike the rather gold-stars-for-everyone approach of Intro to Fiction, Advanced Fiction was a workout. 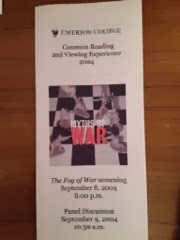 I still remember my professor, Ms. McLarin, a writer-in-residence at Emerson. At the time of our semester, she was getting a book published. I remember she showed us the mockups of potential book covers, which was so cool to a room of aspiring writers. Here's what I remember about that class, nine years on (9 years?!). As much as you call it "Advanced Fiction" and as much as everyone in the room had been writing for years, we weren't all at the same level. I definitely felt lacking during discussions to certain references to books or authors or genres or writing mechanics.